Think Pieces are paper contributions by prominent scholars and practitioners studying the intersections between the micro-context of community information ecologies and macro socio-political developments. All the think pieces submitted by scholars was compiled in an output called Think Piece Summaries. Click here to read the paper. This think piece builds on the insights from the work of CITIGEN. It brings together the conversations among the network of involved feminists through July 2010 to February 2012, to posit some key points of departure in feminist analyses, which could form tentative steps towards a feminist theory of change. 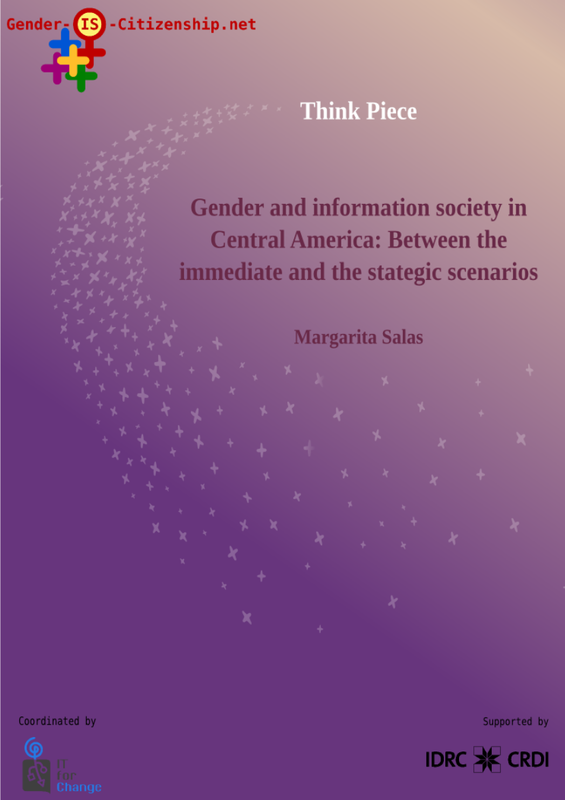 The paper provides an overview of the feminist struggles and their engagement with ICTs, embedded in the political and economic realities of the Central American region. In particular, Margarita Salas focuses on struggles in Honduras, Nicaragua, El Salvador and Costa Rica. Through her paper, she examines the interaction between the global, national and the community contexts and studies the need for and the depth of engagement with ICTs required by feminist movements in the region. The paper explores the emerging information society context in Pakistan, analysing subjectivities in relation to the emerging digital ecologies. 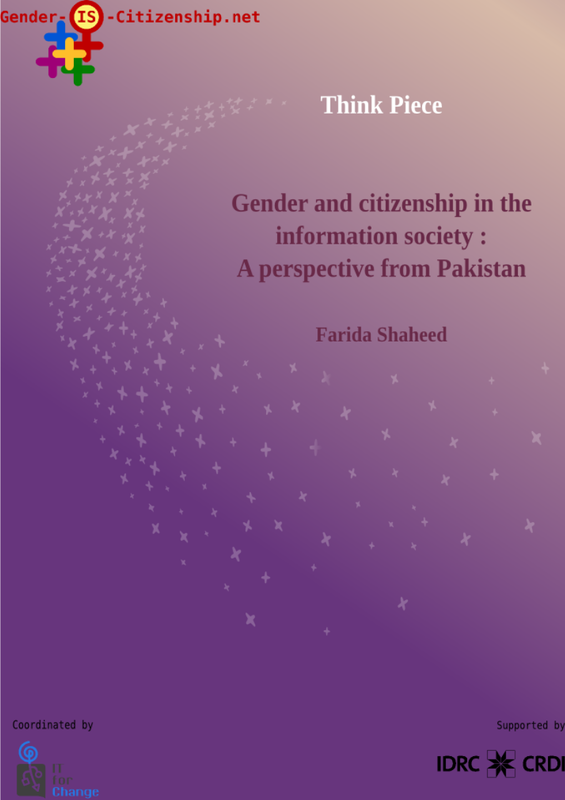 Farida begins with a brief overview of some of the key issues related to female citizenship. She then examines the breaching of the jealously guarded borders of the traditional private-public spheres through the radio, that influenced isolated women to support instead of oppose, the regressive Taliban agenda in Swat. The final section of the paper reflects on the opportunities afforded by social network media and digital technologies for those with access to reconfigure the meaning of citizenship, based on the experience of activism and humanitarian relief in Pakistan. 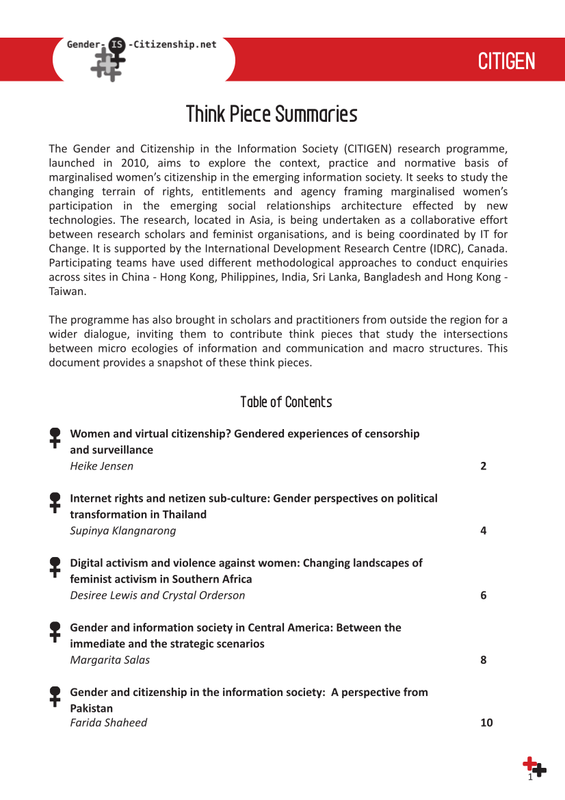 The paper provides a snapshot of the current usage of ICTs in Thailand using gender aggregated data, followed by an account of the political resistance being built by Internet users or 'netizens' in order to counter government restriction and control over the freedom to access and express using online spaces. The paper explores the possibilities of new media spaces, typified by 'free culture', for discourse shaping in areas of not only civil and political rights but also gender justice. The paper ends with relevant policy recommendations. The piece attempts to unravel the relationships between nation state, citizenship and the public sphere, communication and privacy rights, sexuality and morality in the backdrop of the information society and gender frameworks. The theme will be tackled by focussing on two clusters of enquiry: (1) communication rights and censorship and (2) privacy and surveillance. 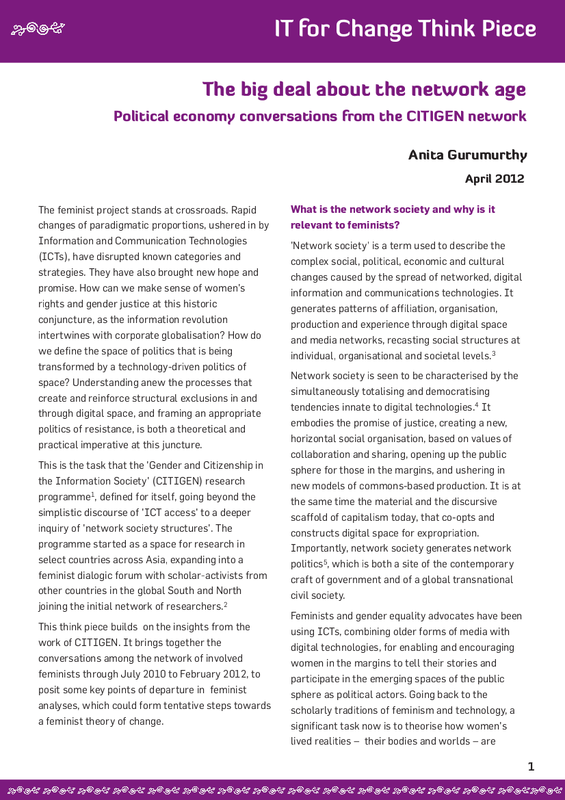 This approach is meant to create a feminist inroad into the prevalent, gender-blind discussions of Internet governance and citizenship that lends itself to elaborations on different levels, from abstract and theoretical hypotheses to discussions of distinct local, embodied experiences. Desiree and Crystal focus on the local and national activism that enlist digital technology and confront violence against women as a site of innovative human rights struggles in the African region. The paper deals with feminist activism driven by electronic communications systems and hybridised forms, incorporating both traditional and new media. The study moves in-between the local, national and regional levels with the aim of teasing out the national and regional implications of local platforms and resistance.